Why do leaves change colors? What is under the frozen ice? And where do birds go during the winter? These are questions we hear every day, as Nature Preschool teachers. Young children’s minds are full of wonders and questions, trying to learn about, connect with, and understand the world they are surrounded by. 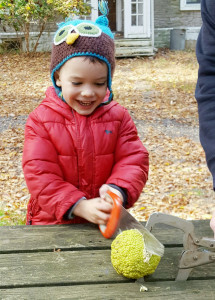 At Nature Preschool, we nurture this natural curiosity in young children by following the emergent curriculum approach. The goal of an emergent curriculum is to create meaningful learning experiences that capture children’s passion, foster inquiry-based experiences, and instill a love for learning. In contrast to a traditional, thematic-teaching approach, topics are not pre-planned in advance nor are they conducted in one- or two-week increments. Instead, a subject of study arises from the interests and developmental needs of the children in a group at any given time. A study can last anywhere from a couple of days to weeks, or even months, depending on how long the interest in the topic persists. The role of the educator is to be an observer and a research partner to the children; guiding the children, asking open-ended questions, constantly reflecting and assessing, and showing enthusiasm. Being a study partner to the children in this process is one of the aspects that I enjoy the most. In my experience, having worked with both, the traditional and the emergent approach, I find that children’s learning experiences become much more meaningful and memorable when we give children the time and space to explore an answer to a question instead of just providing it for them. Children build their self-esteem as well as learn how to problem-solve and to think critically. When I first started teaching with the emergent curriculum, I was nervous about finding topics of exploration that all of the children in my group would be interested in. I thought to myself: “How can I find a common interest among twenty-five young individual minds?” As I became more comfortable and experienced in working with the approach, I learned that having an open mind and observing the children in their natural environment is the key in this step of the process. 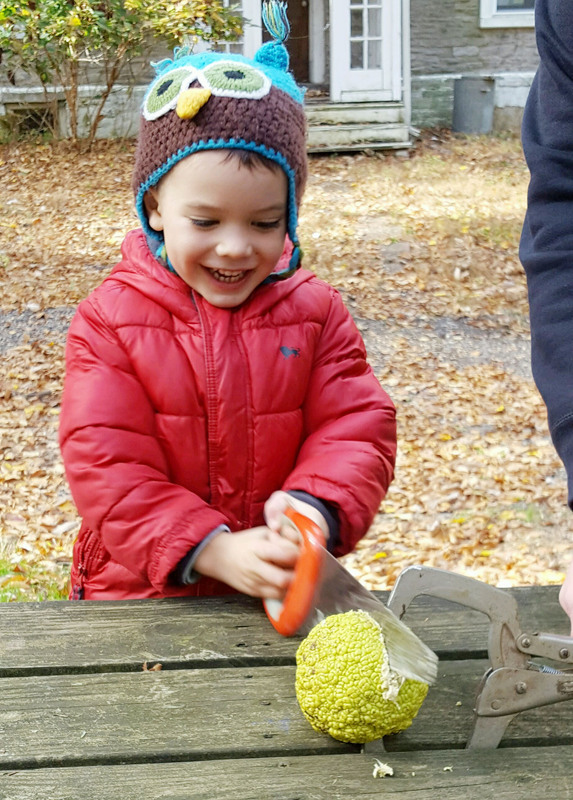 Typically, a curriculum study at Nature Preschool emerges naturally, as the children find wonders in seasonal changes in the environment outdoors. For example, in the fall the children might be curious about the abundance of different seeds or colorful leaves that they find as they explore the forest, or in the winter, the frozen ice on the ponds or tracks in the snow might grasp their attention. However, there is always the possibility that there is a time when no common theme stands out. This happened in the Sweet Gum class this past fall after a month-long study on leaves and the colors of autumn. My fellow Sweet Gum teachers and I brainstormed ideas and then came to the conclusion to ask the children directly what they would like to learn about next. Many curious minds coming together made it challenging to pick from the vast majority of interests. The children were curious about owls, seeds, monkeys, animal brains, and more. Looking closely at the list of ideas, we noticed two common themes: animals and plants. Combining both interests, the Sweet Gums began exploring the “insides” of plants and animals. Since at the time, the harvest season was in full swing, we first started out by investigating the insides of plants. Using a variety of real tools, (knife, saw, hammer, etc.) we opened plants such as a pumpkin, a black walnut, osage orange, eucalyptus seeds, and of course a sweet gum ball. Throughout our study, we asked the children to make predictions and form hypotheses about what could be inside each plant. 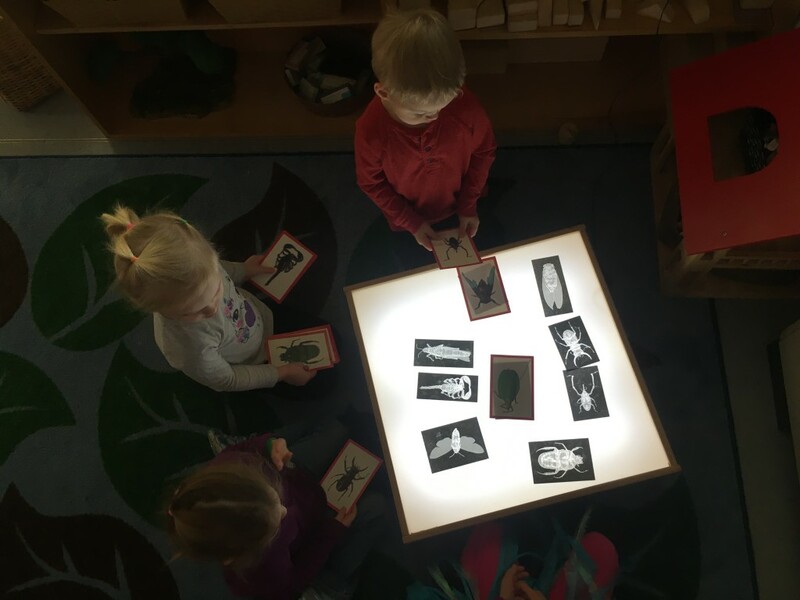 The children said: “maybe squishy stuff,” “lots of seeds,” “nuts,” “air.” Watching the children deeply connect with a particular study is my favorite part about the emergent curriculum. 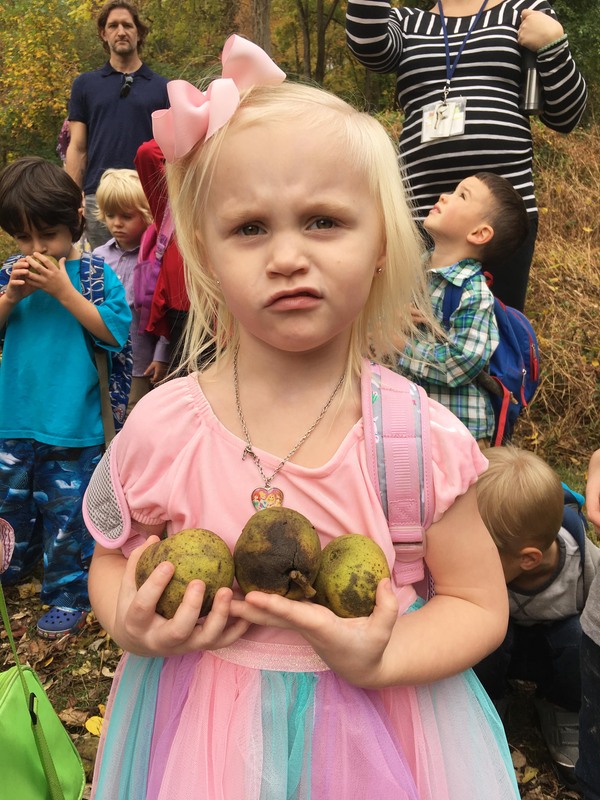 For this particular study, I realized how connected the children were to the topic when they came running into the classroom in the morning exclaiming: “I found this fruit in my yard. Can we open it and look inside?” Or “I went to the grocery store with my family and we found these seeds. Let’s open them.” The children taking ownership of a study shows how meaningful the learning experience truly is for them. After a couple of weeks of inquiring about the insides of plants, we moved on to the insides of animals and asked the children how we could look inside of them. Could we use a knife, a saw, or a hammer, just like we did with the plants? No! Definitely not safe! We came to the conclusion that we need to use other tools and discussed machines such as x-rays and ultrasounds. The Sweet Gums learned all about bones, blood, and organs by engaging in a wide range of open-ended activities involving science experiments, visual arts, and music. The children experimented with colored water representing the matters inside blood, created x-rays with black playdough and Q-tips and by drawing with white chalk on black paper, and used musical instruments to sing “The Skeleton Dance” and “Deep Inside My Heart” song. I’ve got this everlasting light. The more I’ve got to give. It’s what I’m living for. 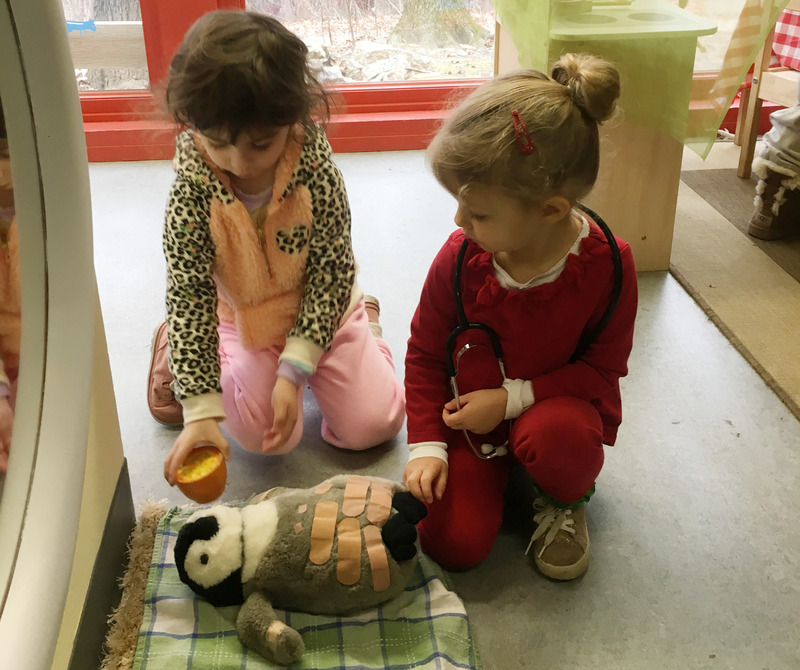 To deepen the connection even further, we turned the play kitchen in our classroom into a clinic for stuffed animals, where imaginary play came to life. The children used real tools, such as stethoscopes, band aids and gauze to cure their injured stuffies. Our light table transformed into an x-ray station where young doctors and nurses collaborated on how to best help their beloved patients. This type of play fosters children’s representational thinking skills as they assign and take on roles/characters and also helps them in developing important social skills, such as collaboration, sharing, and take turns. As the animal clinic in our classroom continues to be in full swing, we remain curious where our study will lead us next; maybe learning about the Schuylkill Center Wildlife Clinic? For me, the beauty of the emergent curriculum surely lays in the endless possibilities of exploration. I cherish that I have the freedom in exploring alongside the children and that studies are ever-changing and never the same as in previous years. Through this way of teaching I hope to instill a love for learning that will carry forward throughout the children’s lives. 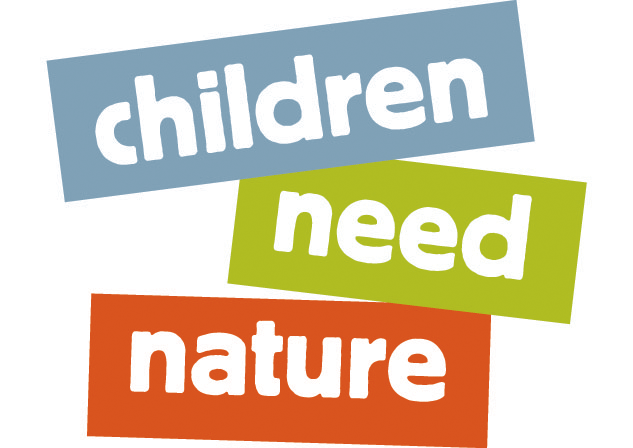 This entry was posted in Children Need Nature, Education, Nature Preschool. Bookmark the permalink. Truly, you are nurturing a love of learning and a connection to the natural world that will impact these young children profoundly. This is really what education at all levels should be about! I miss working with you, Kristina! Thank you Theresa! I agree that this is what education should be about in ever setting and I am very grateful for having the opportunity to teach children in such a meaningful way. I miss working with you too! Thanks for your great article, Kristina. I’m trying to dive into an emergent curriculum which is very different from what I’ve tried before. Do you have any resources recommendations on the teachers role in an emergent curriculum? More specifically, the resources on the planning process when a interest topic is observed? Thanks!